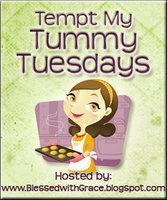 Normally on Tempt My Tummy Tuesdays I share my own recipes, but unfortunately I just haven't had much time lately to cook and I just couldn't resist this recipe. When I logged onto my blog reader today I found this Caramel Corn recipe at Full Bellies, Happy Kids and just had to try it. Not only is this a simple and easy recipe but I have all of the ingredients for it in my cabinet. Next time I make it though I am going to try adding some peanuts or pecans to it. This week I have a ton of ground beef to use up this week, I have had it in my freezer for a while now and I am afraid that it will go bad if I don't use it. So this week is full of recipes that use ground beef. As many of you know a few months ago I went back to work and subsequently started neglecting my blog. I know bad, bad blogger. I knew the job I took wasn't ideal for my family but I needed a job, and I knew it would work until I could find the job that I really wanted. After waiting (not so patiently I am afraid) and much praying I have finally found a new job that is perfect for my family. Monday through Friday from 8 to 5, which means no weekends or nights away from my family. It is really what I need. I am hoping that not only does this new job mean more family time for me but that it also means more blogging time because I really have missed you all. This will also mean more simple suppers throughout the week, stuff I can put together the night before or cook in the crockpot. Free, Free, and More Free! There's nothing that I like more than getting something for free so I thought that I would share these great deals with you all! Jules Gluten Free is offering a free Thanksgiving Gluten Free Recipes Book which you can get hereby entering the code "thanks10". Rite Aid is offering a free 8x10 or two 5x7's with a coupon that you can print here. If you order online make sure that you select in-store pickup so that you can use the coupon! And if you are looking for a studio portrait you can go to coupons.com to print out a coupon to get a Free Portrait Package from Olan Mills which includes one 8x10, two 5x7's, 8 wallets and fifty percent off an additional picture purchase. You can also print out a coupon from Sears to get a free Halloween photo collage, no session fee, and twenty percent off your picture purchase. You can print out both couponshere.